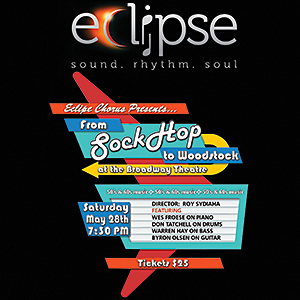 Enthusiastically directed by the multitalented Roy Sydiaha, Eclipse Chorus is energized by one of the finest bands in the land: Wes Froese on electric smile and keyboards, Don Tatchell on drums, Byron Olsen on guitar and Warren Hay on bass. Eclipse can always use more tenors and basses. Always. Have your moment in the spotlight, belting out great tunes with great people and a smokin' hot band. How much better can it get?